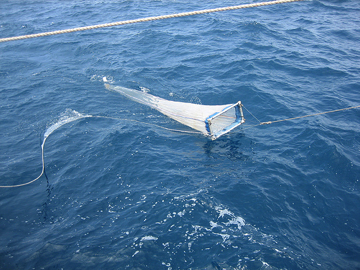 The Neuston net design features a large, rectangular net frame (need picture of frames and description) and a relatively long net for sampling substantial water volumes. The net mouthy shape is useful for surface sampling of tar balls and other near surface to larval fish or delicate organisms. Our standard nets are offered in lengths of 3, 4, 5, 6, and 8 meters (mouth-to-cod end) to provide the large mesh cloth area required. These nets are available in the usual wide range of mesh openings; including 1/8”, 3/16” and ¼” knotless knit mesh. Length and mesh opening should be specified with order. The exclusive, SEA-GEAR Paired Neuston Net design enables two unlike mesh square nets for to be towed at the same time for substantial comparative sampling. 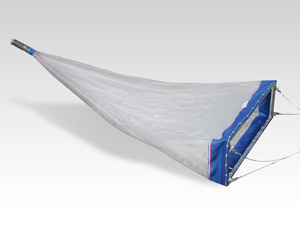 These nets are custom manufactured and designed for the Paired Frame. The Heavy-duty net mouth collar is tailor notched ensuing an easy fit around the frame. The nets are secured to the frame with nylon cords or locking cable ties through equally spaced brass spur grommets. Paired nets are offer with mouth openings of ½ and 1 meter square in lengths of 3,4, 5, 6, and 8 meters (mouth-to-cod end). They are available in the usual wide range of mesh openings. 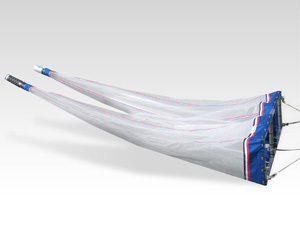 These nets are specified with the model number suffixes indicating the mouth opening, length and mesh size. Example: 95-1.0x4 denotes a Twin Neuston Net with a 1 meter square opening by 4 meters long manufactured from 1000 Micron mesh netting.